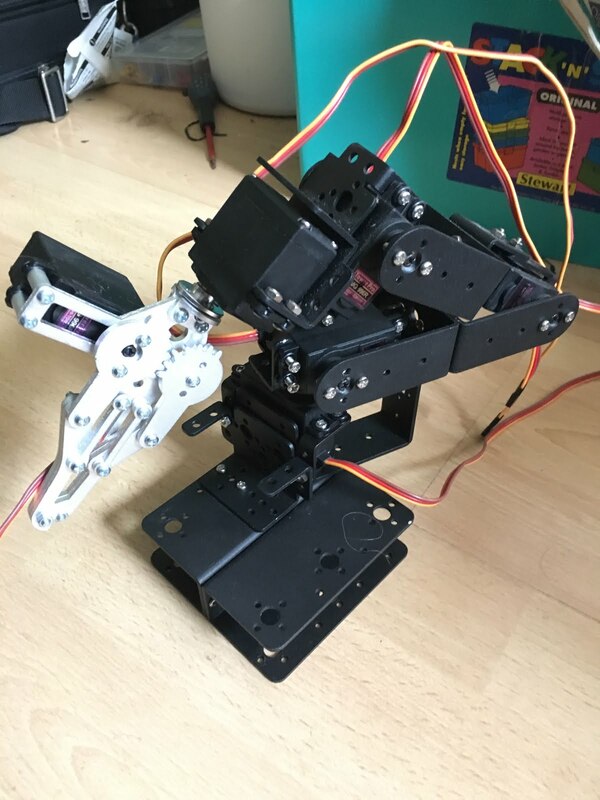 One of the most popular posts on the Sniff blog is my documentation of the robot arm build - lots of people get the kits on eBay or aliExpress and then they arrive without any instructions. You literally get a bag of black metal shapes and some screws! When I built the original I was careful to document everything I did, as even searching online there were no good instructions. 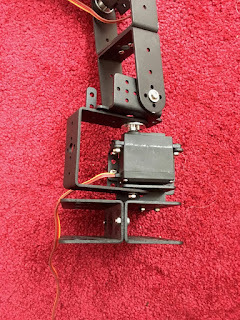 However my research did reveal that there was a "better" kit out there, that had previously been sold, but that the kits currently being sold contained 1 less set of brackets/servo holders. As I noted in the original post, all of the weight and stress from the robot is carried by the base servo, which really isn't great. 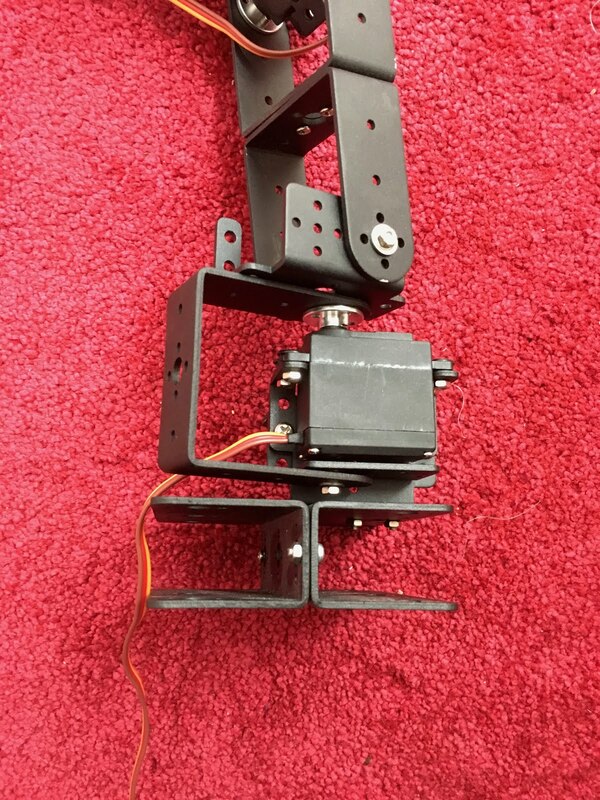 It's fairly easy to find the brackets sold separately, so I bought an extra bracket, and finally got round to rebuilding the base of the arm. 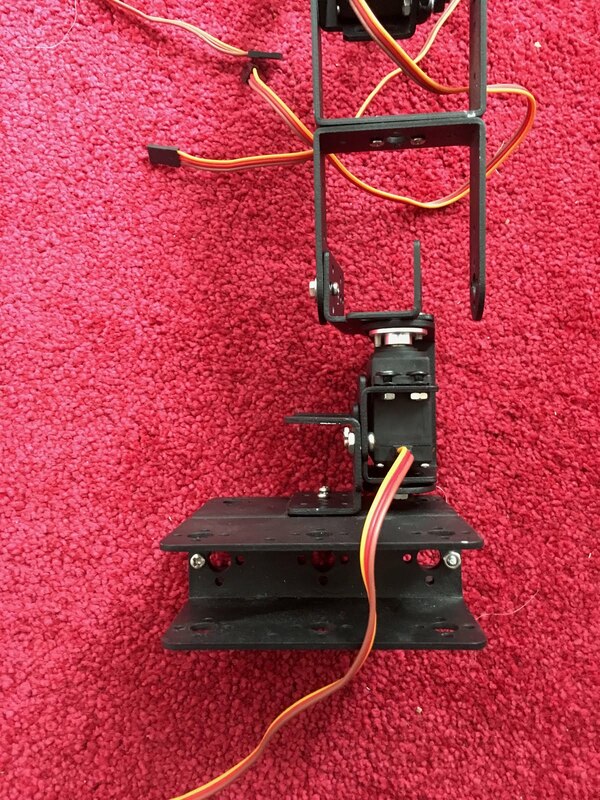 While the base servo is still taking a lot of the weight, its now supported by the bracket, spreading the stress around, and making the whole thing a lot more stable. 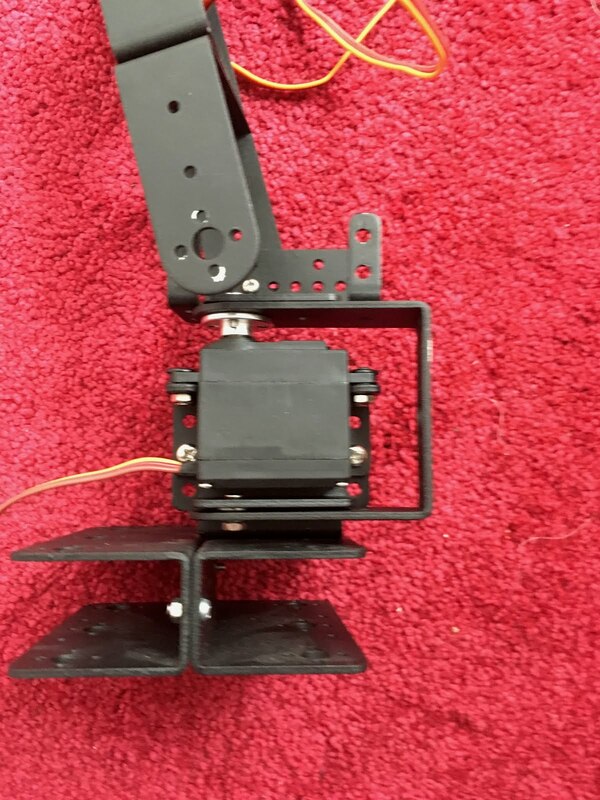 You can see that the base servo is removed from its original bracket, and placed in a new one, which is bolted to the old one... while this may seem redundant, it means there's now clearance underneath to attach a u-bracket around the whole servo. 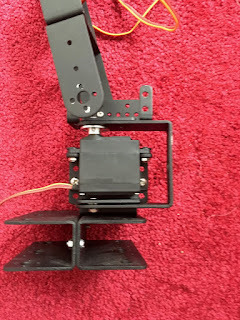 The bracket for the next servo is connected essentially as before, but now the bolts connect the bracket to both the servo horn and the new u-bracket. That means when the arm's weight starts to tip itself over, that sideways force is transmitted (at least in part) to the bearing at the bottom, rather than being fully carried by the neck of the servo. The result is much more stable. 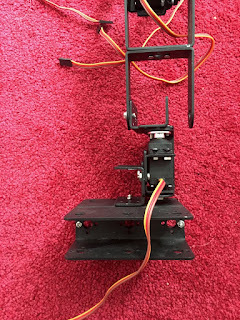 The extra metal work does place some restrictions on range of travel, but only in positions where the gripper would probably be crashing into the table anyway, So generally its looks like a good upgrade. For some reason I was thinking about barcodes... I'm not sure why, but I started wondering if we could make them in Sniff... turns out you can! But wait a minute - that's only 11. The final digit is a checksum. When the barcode is printed the final digit is calculated from the other 11, and added to the end. When its read the same sum is calculated by the reader, and if the final digit doesn't match it knows something's gone wrong and it can reject the code. Here's the beginnings of the main script. We check that the manufacturer and item ID's are the correct length and join them together to make the beginnings of the barcodeValue - the number that is printed along the bottom. You'll note that they're all strings, as the barcode isn't really a number - its more a sequence of digits, and its easier to handle them as strings. To calculate the checksum, we add up the odd placed digits and multiply by 3. Then we add the even placed digits. Once we have the sum we need to find the number to make the sum add up to a multiple of 10. i.e. if the sum is 74 then the final answer is 6, which would make it up to 80. There are a few ways of doing that, but the simplest is to keep subtracting 10 until its less that 11 (i.e. its now 1...10), then subtract it from 10. This is the checksum value and we tag it on the end of the barcodeValue. These represent the digits 0 to 9. .set barcodeWidths to "111 "
..set barcodeWidths to join barcodeWidths " "
.set barcodeWidths to join barcodeWidths "11111 "
.set barcodeWidths to join barcodeWidths "111 "
A barcode begins with two lines 1 unit thick, with a 1 unit space between them, which is represented as 111. Then we add the symbols for the first 6 digits, so if the first digit was a 9 then we'd add 3112, meaning a 3 unit line, a 1 unit space, a 1 unit line and a 2 unit space. In the middle of every barcode is the code 11111, representing 3 thin lines. We then continue on to the end of the barcodeValue, and then tag a "111" end sequence on. In the case of our test code, that gives the above string. You'll note that program adds some extra spaces to separate each digit. These won't appear in the final barcode, but they're handy for checking that everything is working. The next step is to turn those widths in to actually bars. ..if not letter counter of barcodeWidths = " "
.....set barcode to join barcode "|"
.....set barcode to join barcode " "
We simply loop over the length of the barcodeWidths string we just made and get the value of the digit. If its a line we print a vertical bar, otherwise we print a space. The number of lines or bars we print is the width of the line. ..if letter displayX of barcode="|"
...tell image to "set pixel"
Of course what we really should do is draw our barcode as a bitmap and save it to disk. Fortunately that turns out it be really easy - just go through the barcode and if its a "|" draw a line of black pixels. If its a space draw a line of white pixels. Once we're done, we save it to disk. And here it is!!! A perfect barcode, which looks just like the one on the box I took the original number from. Now all that's left to do is print out a bunch of these on sticky labels and go cause havoc in the school library! (actually books use a slightly different format!). What's really nice about this project is that it would make a really great group project. It breaks down really neatly into 4 parts of similar difficulty, which all need to work to make the whole thing happen. On pair of students is given the ID's and has to make the barcode value with checksum. The second has to turn that into line widths, the next turn that into ascii bars, and the final pair draws the bars. As we have a worked example you can provide each pair with an example of the input they need to read, and the output they need to generate, so they can all work at the same time, and then when they know each part is working, they can bring them all together!